Children can travel the world with The Snail and the Whale, zoom through the night sky in Room on the Broom and explore the deep dark woods in The Gruffalo. Featuring eight of Julia Donaldson's best-loved tales as well as their accompanying songs, this jam-packed CD box set is perfect for long car journeys or just a story before bed. Full of warmth and character, the books are performed by some of the UK's most beloved actors and actresses, including Josie Lawrence, national treasure Imelda Staunton and even the author herself - Julia Donaldson! Children will love listening to these classic stories again and again, and singing along to each song until they are word perfect! Julia Donaldson is the outrageously talented, prize-winning author of the world's best-loved picture books, and was the 2011-2013 UK Children's Laureate. Her books include Room on the Broom, What the Ladybird Heard and the modern classic The Gruffalo, which has sold over 13.5 million copies worldwide and has been translated into over sixty languages. Julia also writes fiction as well as poems, plays and songs and her brilliant live children's shows are always in demand. Julia and her husband Malcolm divide their time between Sussex and Edinburgh. 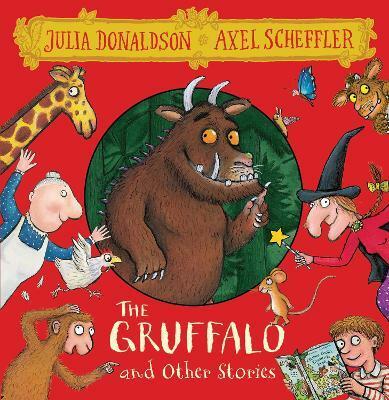 Axel Scheffler is a star illustrator whose instantly recognisable, warm and witty illustrations have achieved worldwide acclaim and numerous awards. In addition to his picture books, Axel is the illustrator of wonderful novelty and gift books for Macmillan, such as the bestselling The Bedtime Bear, The Tickle Book and Mother Goose's Nursery Rhymes. He also illustrates the popular Pip and Posy series, published by Nosy Crow. Born in Hamburg, Axel now lives with his family in London.